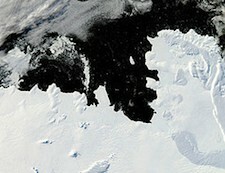 Shifting ocean currents appear to be accelerating ice melt of the Pine Island Glacier Ice Shelf in western Antarctica. According to research published this week in the journal Nature Geoscience, scientists from the Lamont-Doherty Earth Observatory at Columbia University have recorded ocean currents driving at and underneath the ice shelf, carving out an expanding cavity from underneath the glacier, creating a growing impact 50 percent greater than when scientists began monitoring the region in the early 1990’s. Researchers estimate that 2.5 miles of glacier now slide into the sea annually. The accelerating trend of ice can’t be accounted for solely from the modest 0.2 degree Celsius increase in surrounding ocean temperature observed at Pine Island over the past fifteen years. Scientists point to evidence of stronger winds in the Southern ocean that are shifting currents, pushing warmer waters from the tropics toward the ice shelf. That warmer water pushes further underneath the glacier, leading to the observed rate of destabilization and the growing chasm underneath.